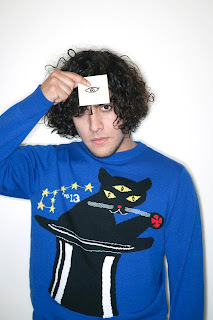 Neon Indian is Alan Palomo, the 21-year-old synth-wizard who first created waves as VEGA. After writing a batch of off-the-cuff recordings that weren't quite right as VEGA songs, Palomo released them as Neon Indian and what started as a careless outlet for ideas too offbeat to fit the VEGA mold has since gone on to define a genre. His critically acclaimed début album Psychic Chasms, which was released in October 2009, has been featured in SPIN, Rolling Stone, Wall Street Journal and FADER among others. In Feb. 2010 he made his late night TV debut with a performance on Late Night with Jimmy Fallon. "Sleep Paralysist" was written by Neon Indian lead-man Alan Palomo; the track was recorded and produced in collaboration with Chris Taylor of Grizzly Bear in Brooklyn at Taylor's elusive musical dungeon, Terrible Studios. This is Neon Indian's first new offering since the release of Psychic Chasms. "Psychic Chasms" was released last October.